Welcome to our last Newsletter of 2011. It seems this year that we went straight from an incredibly long, hot summer to an exceptionally warm and sunny October and then one of the warmest Novembers since the beginning of the 20th Century, albeit rather wetter than usual. With an average of 300 days of sunshine a year, it seems most of the dull days this year were crammed into November. However the wildlife, the garden and no doubt the people who worry about water reserves are all delighted, as it has been a very dry year up to now. On that note, we have included in this edition some ideas for things to do on that rare occasion when the weather isn't that great. Also in this edition, we have included articles on buying property for holiday rental, Christmas in France, the Limoux Carnival (the longest running in the world) and Oysters from Languedoc together with our regular wine and restaurant reviews. There are two very seasonal and typically French recipes that you might like to try during this festive season - Bûche de Noël (chocolate yule log) and Oysters with Caviar and Blanquette Sabayon. We hope you enjoy it. Wishing all our clients, old and new, a very merry festive season and a prosperous New Year in 2012. According to Météo-France, November was the second warmest since the beginning of the 20th Century. We are looking to expand our professional team, particularly in the Gard, Hérault and Carcassonne areas. We are looking for people who are bi-lingual and preferably with previous experience in the real estate business or sales generally. Also, we are looking to make alliances with 'apporteur d'affaire' who are people that indicate properties for sale to the agency for which there is an introduction fee if the property is sold by us. Two fabulous properties going for an absolute bargain! 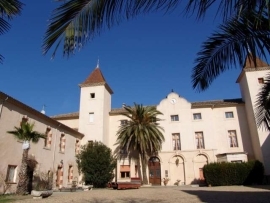 Located in the Languedoc-Roussillon, Department of Hérault, this wonderful 17th Century Château is a Hotel & Restaurant with 19 en suite bedrooms and the possibility to add a further 20 bedrooms. It has large reception rooms suitable for weddings etc, two swimming pools (one of which is heated), a lovely landscaped park and a total of two hectares of grounds. Within easy reach of a City, the sea, an International airport and a golf course, this property nestles within quiet vineyards and is a stunning location in a growing tourist area. This property is being sold entirely furnished and could easily be upgraded to a 4 star hotel. Excellent value for money and definitely worth a visit! 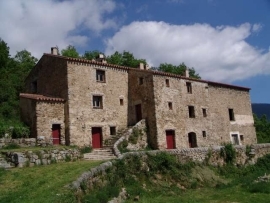 Fantastic 15th Century Catalan Mas, located on a south east sloping hill in the Roussillon, in the countryside of Perpignan and the beautiful valley of Vallespir. This property has wide open views as far as the sea and the Spanish border on a clear day. Nestling in the heart of pure nature, it is only a short walk to the nearest village with a basic shop and restaurant and 10 minutes to the next larger village with all amenities. It has 2 apartments, 51 hectares of land and outbuildings that could be converted into gîtes. With spa towns and ski slopes nearby and a paradise for hiking, biking and horse riding, this has great tourism potential! If you like nature and a quiet lifestyle then come and visit this property. The Languedoc-Roussillon still remains relatively unscathed despite the economic crisis around the world, It is a popular location for a second home or a new permanent life. Prices are competitive compared to other areas in the South of France and it is a great location nestling between the Mediterranean beaches and the mountain ski resorts. France is a stable country that offers a more relaxed pace of life under the sun and now is a good time to buy as there are some great deals to be had. France consistently voted best place in the world to live - it's official ! Every January International Living look at almost every country on Earth and ask: How do they stack up against one another? France consistently features at the top of their list for quality of life. For five years in a row France was in 1st place. In France, Christmas tends to be celebrated 'en famille' while New Year is for your friends. Christmas is called Noël which comes from the French phrase les bonnes nouvelles, which means 'the good news' and refers to the gospel. A traditional log-shaped cake called the buche de Noël, which means 'Christmas Log' or 'Yule Log' is served during the Christmas festivities made of chocolate and chestnuts. This is representative of the special wood log burned from Christmas Eve to New Year's Day which, in days of old, part was used to make the wedge for the plough as good luck for the coming harvest. Languedoc takes up half of France's Mediterranean coast with four of the five Departements of the region bordering the Mediterranean Sea. With 177km (110 miles) of coastline it's not surprising that seafood is popular here. The carnival held in Limoux, south of Carcassonne, Aude, each year from January to Easter is a tradition that has been followed for centuries - it is claimed that this fête, called Fécos has been held continuously since the middle ages. For ten Saturdays and Sundays leading up to the second Sunday before Easter, various local groups called les bandes wearing different masks and costumes parade through the town three times a day playing music, singing songs and playing pranks - all conducted in the ancient Occitan language. Languedoc-Roussillon has on average 300 days of sunshine a year, but there are times when we get a dull one, so here are some ideas on what to do on that rare occasion when the weather is inclement. Ex- international rugby player Gerard Bertrand was born and brought up in the South of France and has been making wine with his father, Georges, since the age of 10. He now owns 410 hectares of vineyards across some of the most beautiful areas of Languedoc over 5 estates, 80 hectares of which come under his flagship estate, Château l'Hospatilet. He has based his Head Quarters here in the La Clape region of the Languedoc, between Narbonne and the Mediterranean sea. There are extensive visitor facilities, a large wine cellar, restaurant, Hotel and shops selling local products.